The most versatile instant adhesive in the world. 1 adhesive welding 10 grams. Concentrated performance combined with accurate dispensing technology. High strength and speed on all materials and surfaces. 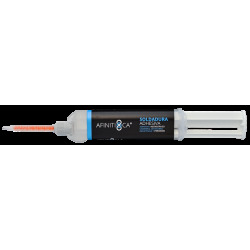 AFINITICA® Adhesive Welding is a gap filling instant adhesive that bonds in seconds, and a 30 minutes open time on-part to enable user convenience. Its recloseable package allows multiple clog-free usage of the entire contents.